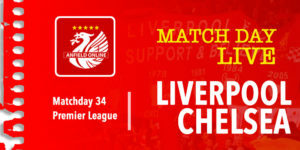 The reds welcome league leaders Manchester City to Anfield in the weekend's big Premier League clash. Both teams start the game level on 19 points, the men from Manchester ahead of Liverpool on goal difference. An international break follows this game, so the reds will be hoping to put some recent poor results behind them. Liverpool were knocked out of the League Cup at Anfield by Chelsea, before claiming what was probably a good point at Stamford Bridge. 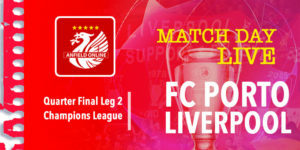 Last midweek the reds were not in the groove when they deservedly lost their Champions League away game against Napoli. Naby Keita suffered a back spasm in that game but could return to the Liverpool line up today. "I don't think it makes sense in this moment to think about the title. Manchester City is always tough, even when we won 3-0 in the Champion League. 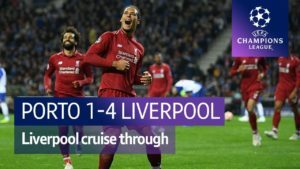 In the 4-3 [Liverpool win] they were really good. They never gave up even at 4-1 down. "We have to be spot on, at our best to keep them away from our goal and create chances in front of our goal. It will be hard work, no problem with that, everybody knows it." "Liverpool will beat a lot of teams, not just Man City. Liverpool is one of the true greatest teams in England. We try to be close to them in terms of many, many things. "[Jurgen Klopp] has all the qualities that everybody knows about Liverpool. At the end, it's the teams and the clubs that win the game. I don't play against the manager, we play against Liverpool. He is an excellent manager, I have a lot of respect for the way he plays, his proactive teams." Captain Jordan Henderson comments from today's official matchday programme. “I can’t remember the last time the team put in a performance whereby I felt we needed to apologise to our supporters, but Wednesday night in Naples certainly felt like one of those immediately after the final whistle. “When we walked off the pitch at full-time the away end were still singing, but the truth is it’s our fans and not us that deserved applause and appreciation at the end. At the time of doing this column I can’t offer an explanation beyond: we weren’t good enough. We hold our hands up as a team, we got what we deserved on the night. But, as has always been the case with our team, we win together and lose together and we all take equal responsibility for it. No excuse and no hiding. Two changes for Liverpool. Henderson replaces Naby Keita, whilst Dejan Lovren starts instead of Trent Alexander-Arnold, who is marking his 20th birthday today. Chelsea win 3-0 away at Southampton and leapfrog both City and Liverpool in the league. Chelsea are now top on 20 points. Both City and Liverpool have 19 points prior to kick off. 4' Salah twists and turns John Stones but his shot is drilled wide. First bright moment of the game. 6' Liverpool working hard to keep Man City in their own half. Good pressing by Henderson to win the ball back, the reds are running forward, but Sadio Mane miscontrols the ball. 9' James Milner with Liverpool's first corner of the game but it's straight down the throat of Ederson. 11' Corner number two for the reds. Lovren gets his head on it but there's not enough power and Ederson gets down to save. 14' Danger from Man City who attack with pace. Raheem Sterling earns City a corner. 15' Liverpool clear the corner and we're away down the other end. Ambitious through ball attempt to Salah but it's overhit and City regain the ball. 17' Good possession period from the reds, eventually Henderson sees the opportunity and plays a long pass forward that almost finds Salah. 21' Joe Gomez with a wayward pass to Sergio Aguero inside the Liverpool area. Lovren prevents Aguero from converting the chance. City players suggest there was a shout for a penalty but Aguero not interested. 23' Bernardo Silva collects a yellow card. Mid-way through this first half and it looks like City have settled from the initial Liverpool storm. They are growing in confidence. 29' Looks like Milner has suffered a hamstring injury here. Naby Keita comes on to replace him. 41' That substitution hasn't helped Liverpool's momentum. Man City are beginning to look comfortable towards the end of this first half. This game may not be the goal-fest we normally see in these games. Liverpool look a little bit tired here - our front three is not fully functioning. 44' Free kick for City. It's about 35 yards out. Too far too shoot. 45' They attempt a looping cross out to the wing but it's knocked out for a throw in. 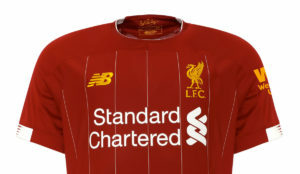 Liverpool clear it. Bright start from Liverpool but faded during the first half. Milner subbed off with suspected hamstring injury. Surprisingly few good chances for either team. Here we go again. Liverpool kicking towards the Kop. 53' Slight signs that this game might get more exciting. Liverpool's front three are keeping a much higher line in this second half. 56' Yellow card for Aguero after a foul on Jordan Henderson. 60' More penalty appeals for Man City who are claiming a van Dijk handball. It looked like the Liverpool defender was being dragged back and the reds are awarded the free kick. 61' David Silva through ball and Riyad Mahrez beats Andy Robertson to get a shot away. 62' Robertson gives the ball away and City are in for another chance. Alisson saves low at the corner of the goal. 62' Quick break from Liverpool - Gomez to Salah and the Egyptian's shot is saved. 64' That's a yellow card for Benjamin Mendy. 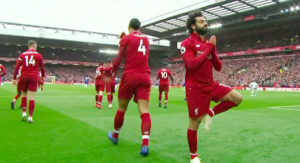 He dragged Salah back when he was running to reach a pass. 66' Aguero heads off to be replaced by Gabriel Jesus. That's 10 appearances for Aguero at Anfield without one goal. Salah's free kick from an angle is bending towards the goal but it beats everyone, including the keeper and goes out for a goal kick. 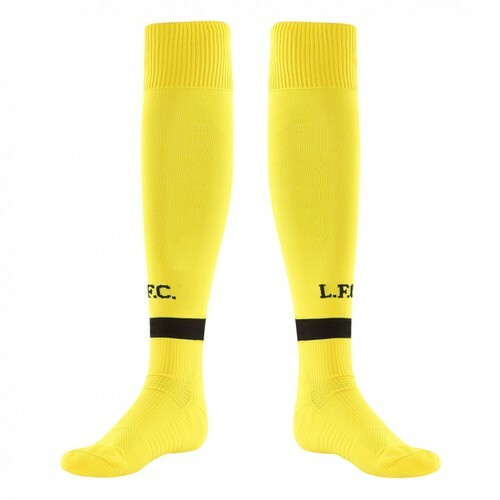 69' Great move by Liverpool with a quick goal kick. Robertson sends the ball through to Mo Salah but he launches his shot high in to The Kop. 72' Sturridge is on. He replaces Firmino. 76' Leroy Sane replaces Raheem Sterling. City have had a couple of chances in the past few minutes and the sub came just before a City corner. Liverpool cleared. 79' Gomez powers down the wing. He beats Sane and gets the cross over. Sturridge rises to head it but there's not enough pace on his header. 84' Sadio Mane comes off worse with a collision with Fernandinho. 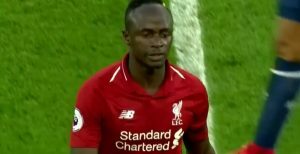 The City man's arm slapped into Mane's throat. 85' PENALTY to Man City. Van Dijk foul on Leroy Sane. He fires the penalty well well well over the crossbar. Lively now. That missed penalty has given Liverpool some belief. 90' We're having 3 minutes of added time. It wasn't the cracker we were expecting. It looked like City would win with that 86th minute penalty but a draw is a fair result.